I have a good number of router bits for different purposes that I have accumulated over the years…some good and some not so good. 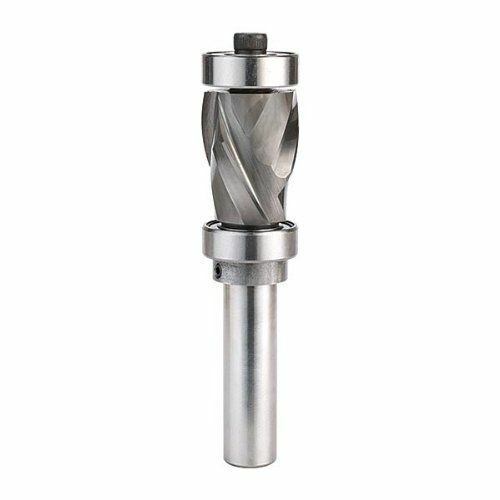 I have been looking at this spiral combo bit from Whiteside for a while…hoping it would go on sale…but it never seemed to…so and finally decided to buy it. I have given it a good workout before writing this review because it is not my everyday bit and isn’t cheap at $149. I’ve used it in my router table and also with a handheld router. All I can say is WOW, it is worth every penny because it does make some extremely clean cuts on woods that have given me a lot of grief in the past. Zebrawood, Wenge and a few others normally love to splinter and chip with most bits when I go on that certain neverland direction across the grain. A lot of sanding is involved afterwards to make things right. I have other up cut, down cut and spiral compression bits that are great but they didn’t have the upper and lower bearings that this one does. The 7/8” diameter of the bits also keeps the cuts chatter free and smooth as silk. I also have this bit and it is wonderful! I use it on some templates I have and it cuts like a dream. I hope it stays sharp a good long time because I can’t see it being sharpened and like you said, it’s not cheap. The best pattern bit I’ve ever used by a long shot, some would say…the “Ultimate” pattern bit! I have been extremely pleased with all of the bits that I have purchased from Whiteside. They are now my first choice when getting new bits. Hopefully they will come out with this same double bearing bit in a 1/2” diameter. Thanks for the review. Like others, I’ve been looking at this bit but haven’t pulled the trigger yet. Also, I agree on Whiteside bits and they have been my first choice for the past ten years or more. I am still trying to wrap my head around the cutter design. If it really does such a great job on those difficult wood grains, I may have to add it to my collection, as well. I assume this is the real advantage this bit design brings to the table? I usually only concern myself with up and down cuts if I have a laminated surface or backing that I am trying to avoid chipiing\tear out. I already have a 1/2” double roller straight bit. I have been looking around and can’t find anyone here that sells them, Which store’s sell them? Kiefer told me about them awhile back, claimed the best he has every used! You can try Woodcraft. I don’t know how bad the international shipping charges would be, but it’s available. I have been looking around and can t find anyone here that sells them, Which store s sell them? Thanks for the heads-up. I’m also a devout user of WhiteSide products, but had not tried this one. I’ll have to put it on my “to do” list. I’ve never had even a small complaint about a WhiteSide bit. Can’t even begin to say that about others. Carbide Processors has several of these ultimate trim bits. You’re welcome and thanks for the friendly advice. The cutting pattern sure is intriguing. Thnx for your review Greg. I’ll keep this in mind.